LOS ANGELES (CBSLA.com) — Scott Hunt grew up in the Inland Empire. When he had his first taste of salt air, he was hooked. It was probably why he named his boat Salty Tales. The fisherman runs regular charters, and that makes him the perfect ambassador for CBS2/KCAL9’s chief meteorologist Josh Rubenstein to find evidence of the much-anticipated El Niño weather phenomenon this winter. Rubenstein and Hunt, along with a fellow fisherman, set out to find a wahoo, which is like the Holy Grail for a Southern California fisherman. Normally, one must go to the southern tip of Mexico’s Baja California peninsula to catch one because wahoo are usually found in tropical and subtropical seas. But this year is different, as there have been a number of sightings of wahoo, hammerhead sharks, oarfish and marlin. Catching a wahoo hundreds of miles from where the fish are normally found off Cabo San Lucas could prove El Niño may be near. During an El Niño event, equatorial waters in the eastern pacific are warm. This year, that temperature change has been significant, exceeding 2 degrees. That small change translates into powerful shifts in the Southland’s weather patterns, according to Rubenstein. In the past El Niño years, Southern California has been slammed by tremendous rainfall. While the jury is still out on a waterlogged winter, the verdict is in when it comes to tremendous changes in California waters. 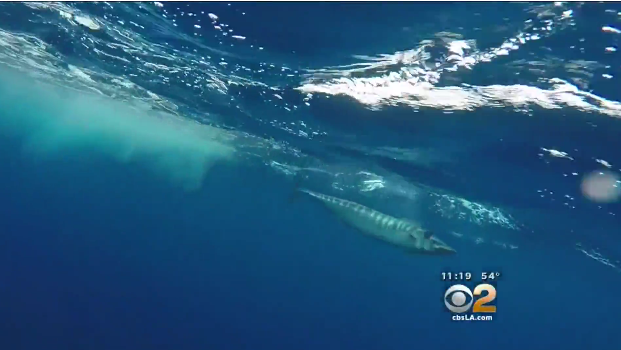 “These marlins: the blue marlin, the black marlin that are here, the wahoo. I mean, that’s just unheard of basically. That’s really where it gets really crazy for this El Niño,” Hunt said. In non-El Niño years, upwelling of cold ocean water brings nutrients to the surface of the ocean, making it readily available for fish. El Niño events effectively cut off that circulation, and fish are forced to migrate to new locations, like Southern California, to find food, Rubenstein said. It took Hunt and his friend only one hour to reel in the catch of their life time, the wahoo, off the Southern California coast. Both men cheered in triumph and high-fived as they loaded their rare catch on board. But it is not just the variety of fish that are coming up, it is the volume. “We have so many yellowtail right here, fisherman are jaded on yellowtail. They don’t want to even catch yellowtail,” Hunt said. Hunt’s catch of a wahoo may be a proud tale for him to tell. It could also be a chilling omen to a winter of flooding and destruction.